Fashion in golf? Men hardly bother with fashion when it comes to what to wear on the golf course. Amateur golfers just wear what they always wear, something practical. Women golfers however pay more attention to fashion, just as they do in everyday life. However, in 2017, along came this “clarification”. Women’s golf apparel has in recent years broken the mold from its traditional looks of knee length shorts and collared shirts. But in mid-2017, the LPGA seemed to be taking a step backwards with its new dress code policy which restricts female athletes apparel choices even further. Incredibly, players received an email marked “Important” from LPGA President Vicki Goetze-Ackerman on July 2 that outlined the new dress code policy and warned they would face a $1,000 fine for any violations. Wow! Racerback with a mock or regular collar are allowed (no collar = no racerback). Pretty strict stuff! The LPGA defined these “rules” as clarification, not regression. Not surprisingly, these “rules” were not very popular and, apart from the restriction on plunging necklines, were not adhered to. Thank goodness! A huge trend we saw last Spring was an abundance of bold printed skorts, from florals, animal prints, geometrics and stripes. Golf apparel has never been more stylish, sporty and influenced by latest fashion trends. Golf fashion today is addressing the need of the modern golfer which in turn is going to attract more girls and women to the sport. Spending up to five hours in any outfit means you have to love what you wear and feel great wearing it too. Gone are the days of the square fit polo shirt or the knee length A-line skirt with no shape. Golf fashion is taking inspiration from tennis. Featuring moisture wicking and cool feel fabrics, while being comfortable and stretchy – designs are allowing for ease of movement. For those of you who didn’t know, moisture wicking fabrics are modern technical fabrics that draw moisture away from the body, unlike cotton which absorbs very little moisture. Long hours in the sun mean that long-sleeved polos are becoming more popular. Very sensible. Feminine and flattering, dresses are one of the latest trend in ladies’ golf clothing. A skort is a pair of shorts with a fabric panel resembling a skirt covering the front, or a skirt with a pair of integral shorts hidden underneath. A skort looks great on top athletic golfers like Michelle Wie but what would happen if you turned up at your club on a Sunday morning wearing something similar? They are very short but are they practical? Another major trend is mixing deep vibrant colors with soft bright colors. Overall, color plays a key role in how a collection is merchandised for both buyers and end customers. This color-on-color trend makes what was once a basic polo suddenly appear original and contemporary. A mix of florals brightens up the ranges. You can wear these colorful prints in two ways – go all out and wear top to bottom in one print so that it looks like a dress or jumpsuit or pair the bold designs with block colors and neutrals for a more toned but striking combination. Previously prints were seen as over-the-top, but now it’s difficult to find a ladies’ golf line that doesn’t have multiple versions of an all-over print. Some styles feature an all-over printed pattern, others just a small detail, such as a printed side inset. Prints have remained geometric in style, embodied by abstract artwork, and are overall symmetrical in feel. All across the tours, we are seeing the professional tour players like Olivia Cowan dress in a sleek, but sporty style of short shorts, straight fitted skirt with the new addition of ruffles, pleats and cute flips on sides or backs of the skirt. Outfits are pretty and add flare. 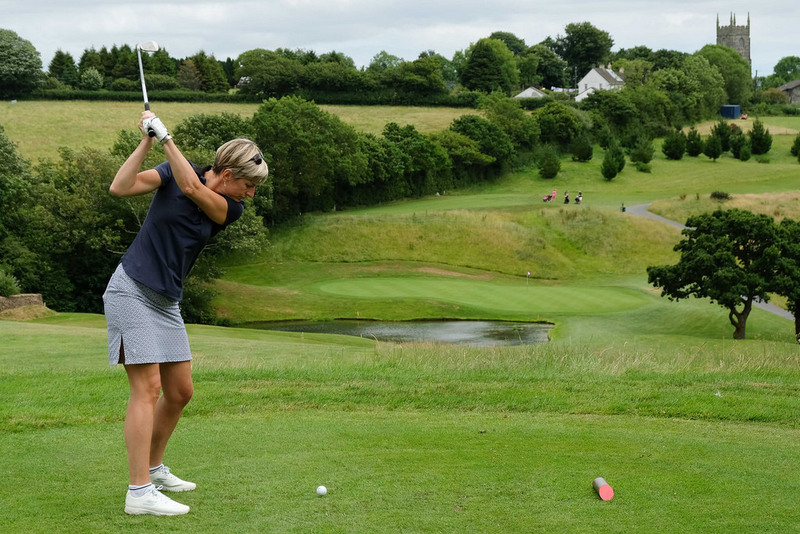 Being comfortable during a round of golf must still be the number one priority, and for those of you who are just starting out in this wonderful but very difficult sport, here are some ideas on the best golf clubs for women to buy.